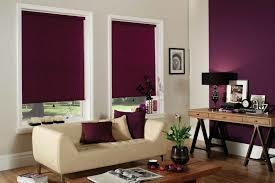 Roller blinds are all based on fabric or material attached to a tubular roller mechanism. Within this product grouping, lie a great variety of systems. The specifier should take care to emphasise the exact requirements to obtain the most suitable product. 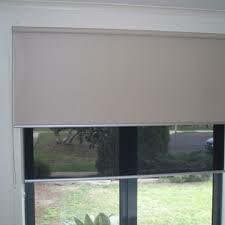 Roller blind – Free hanging blind consisting of a roller with cloth attached so the cloth can be wound onto the roller. Generally used for solar shading, light control and general decorative purposes. 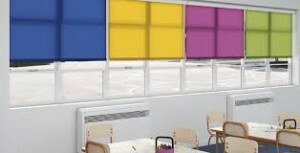 Cassette blind – Free hanging Roller blind (as above), but with the roller assembled within an enclosure or box so the roller cannot be seen. This term can sometimes assume to include side channels to hide the cloth edge. 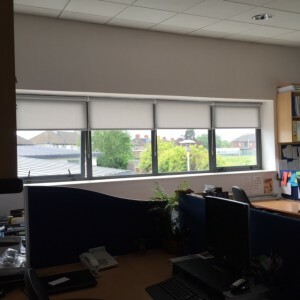 Dimout blind – Free hanging Roller blind (as above), but with a light resistant cloth and light resistant features to the top, sides and bottom of the window. Side Chain -Endless Loop Chain operation (mechanism sometimes referred to as friction roller, sidewinder or ball chain roller). Pull one side of the loop and the blind will lower, pull the other chain to raise the blind. Spring Side Chain -As the Endless Loop Chain operation, but a spring is used to make the operation light and easy. 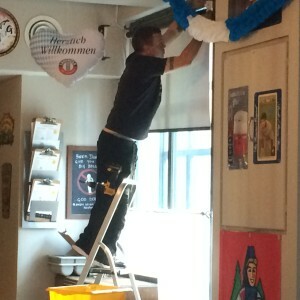 Lock Action Spring – Standard Spring Roller Blind Operation. The blind is usually pulled down by a centre cord and will stop at any point by virtue of a ratchet mechanism. To raise the blind, sharply tug the blind down and allow to ascend. Care should be taken not to let the blind fly up to the top. Decelerator Spring “ As the lock Action Spring, but the speed of ascent is controlled by a decelerator (braking) mechanism. Other variations of decelerator operation are available. Self Acting Spring – A Spring Roller with no locking mechanism so the spring is always acting to close the blind. This is often used in Rooflight applications where the blind is drawn by pulling and cleating off a cord. Flange End Roller – Also called, Single Line Roller. A roller fitted with a pair of flanges to one end, so as the cloth lowers the control cord is wound up between the flanges. Pull the cord to raise the blind. This is a traditional form of blind and not commonly used. Sheath End Spring -As the Flange End Roller, but fitted with a spring. To lower the blind, the cord is pulled, to raise the blind, the cord is released. This is a traditional form of blind and not commonly used. Electric – A motor is fitted within the roller, so only a very small part of the motor is visible. The motor contains limit switches that are set to stop the blind at the top and bottom of its travel. Control is by a switch or by a choice from the wide variety of control equipment available. There are two fundamental types of motor, low voltage (24V.DC) or mains voltage (240V.AC). 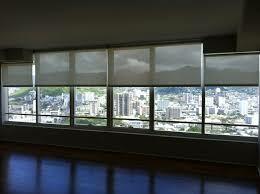 Generally, low voltage are for smaller blinds, and mains for larger blinds, but there are exceptions. Radio Motor – The same as Electric Operation, but the motor is fitted internally with a radio receiver. All control and setting is by the handset. As a general rule, one to any number of blinds can be operated from a single handset and the handset can have one or more control channels. 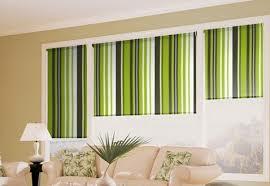 One to any number of blinds can be programmed into each channel in any order or combination required. This can be changed at a later date by a simple programming procedure. Usually available are handsets that look like normal wall switches. These can be fitted anywhere (within range) and no wiring is necessary. Key advantage of Radio motors is the simplicity of wiring. Aluminium – This is a common highly versatile material used in a variety of systems, from the largest to the smallest. Steel – This is a common material used in a variety of systems, from the largest to the smallest. The steel should be galvanised or painted to protect against rust. Wood – This is not so common, and is generally only used as a spring roller on small to medium size windows. 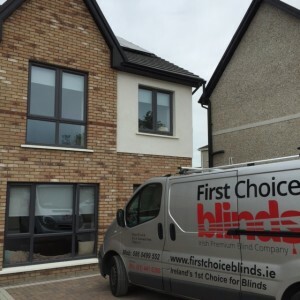 Fibre – Generally for use on small windows on budget applications, DIY or mail order. Tin – Not used any more, but may be found in old/traditional Roller Blinds. Consists of tin plate steel, rolled and soldered to form a tube. There is a vast array of cloth types, patterns and colours available and sold according to customer requirement and function. Some cloths are more suitable than others for specific requirements, but this can only be found studying the data provided by the manufacturer. Is through visibility required?You can generally see from the darker side through to the lighter side. This fine during the day when you want to see out, but at night others can see in¦ Closed weave fabrics will prevent or limit through vision, open weave fabrics will allow through vision. How much light reduction do you wish to achieve? Openness factor is looked on as a factor of shading. This is not true. You need to look at the Visible Transmittance Tv (see below). It is very important to select a low Tv figure when reflection on computer screens is a concern. Is Heat Gain an issue? Limiting heat gain will reduce the heat load on the building. In other words, it will stop the building heating up in the sun. Paying attention to this point will reduce air-conditioning costs and allow for a more pleasant environment. Sc measures the efficiency of a fabric in filtering heat coming from the solar radiation. This figure ranges between 0 and 1. A low figure shows an excellent protection against the incoming heat. Please note that the Sc for an external application is better than the Sc for an internal application. Tv measures the percentage of visible light coming through the fabric. A low figure shows a very efficient fabric. The TV is identical whether the blind is placed inside or outside. Of measures the proportion of holes in a fabric. This parameter is important to figure out the degree of visibility through a fabric. The Of is expressed as a percentage. A low of shows that the fabric is a very close weave. Ts measures the proportion of solar energy transmitted through a fabric. It is expressed as a percentage and for the fabric alone. A low figure indicates a good filtration of solar energy by the fabric. Rs measures the proportion of solar energy reflected by the fabric. It is expressed as a percentage and for the fabric alone. A high figure indicates a good reflection of solar energy by the fabric. As measures the proportion of solar energy absorbed by a fabric. It is expressed as a percentage and for the fabric alone. A low figure indicates a low absorption. Acorn -Wood or plastic acorn attached to pull cord. Pocket -Pocket formed in the cloth at the bottom to accept lath or weighting strip. Hem Bar -Instead of the pocket, a solid bar or rail is attached to finish the bottom of the cloth. There are a variety of shapes, sizes and finishes according to the product and function. Cross Rib – Stiffening batten. Usually in pocket across the width of fabric to prevent bowing. Scallops – Various shapes to enhance bottom of fabric fitted beneath the lath.